Today, I’m going to take a look at 2008’s divisive, live action film adaptation of Speed Racer. Speed Racer was written and directed by the duo of Lana and Lilly Wachowski, who are best known for The Matrix trilogy, Jupiter Ascending, Cloud Atlas, and the television series Sense8. 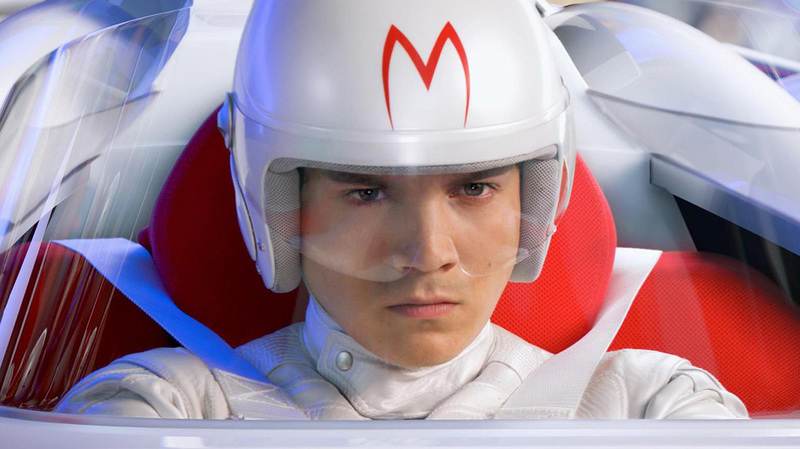 The central cast of Speed Racer includes Emile Hirsch (Into The Wild, Milk, Killer Joe), Susan Sarandon (Thelma & Louise, Igby Goes Down, The Rocky Horror Picture Show, Bull Durham), John Goodman (10 Cloverfield Lane, The Big Lebowski, Blues Brothers 2000, Barton Fink, Matinee, King Ralph, The Flintstones), Christina Ricci (Monster, Black Snake Moan, Casper, The Addams Family), Matthew Fox (Bone Tomahawk, Lost, Alex Cross), and Rain (I’m A Cyborg, But That’s OK). The cinematographer for the film was David Tattersall, whose other credits include Tooth Fairy, Next, The Green Mile, Soldier, Con Air, The Matador, Die Another Day, and Theodore Rex, among others. Speed Racer employed the work of two primary editors: Zach Staenberg (Bunraku, Ender’s Game, Lord of War, Police Academy, The Matrix) and Roger Barton (The Grey, The A-Team, Bad Boys II, Ghost Ship, Pearl Harbor). The musical score for Speed Racer was composed by Michael Giacchino, who also provided music for Doctor Strange, Rogue One, Jurassic World, Super 8, Ratatouille, Up, and John Carter. The designer for the production was Owen Paterson, who has done work on such visually distinct films as The Matrix, Gods of Egypt, The Green Hornet, Red Planet, and V For Vendetta. Keanu Reeves, whose career was resurrected by the Wachowskis’ The Matrix, turned down the role of Racer X in Speed Racer. Other alternative casting rumors about the production include that Kate Mara was at one point considered for Trixie, and the lead role of Speed could well have gone to Joseph Gordon-Levitt, Zac Efron, or Shia LaBeouf. There were multiple attempts to make a film adaptation of Speed Racer over the years prior to the Wachowskis’, dating back to the early 1990s. Various planned incarnations were set to feature Nicolas Cage, Johnny Depp, and Vince Vaughn over that time period, with Alfonso Cuaron, Hype Williams, and Julien Temple all being attached to direct the film at one point or another. PETA, the contentious animal rights organization, claimed that the production of Speed Racer engaged in animal cruelty. This was confirmed by the American Humane Association Animal Safety Representative who worked on the set: specifically, there was an incident where the animal trainer hit a chimpanzee in retaliation for biting an actor. Speed Racer has the unenviable claim of receiving a Golden Raspberry nomination, which are given out to the worst films and performances of a given year. In this case, it was nominated in the category of Worst Prequel, Remake, Ripoff, or Sequel, but lost out to Indiana Jones and The Kingdom of the Crystal Skull. The reception to Speed Racer was fairly mixed: it currently holds Rotten Tomatoes scores of 39% from critics and 60% from audiences, along with an IMDb user rating of 6.0/10. Financially, however, it did not far well at all: on a production budget of $120 million, it took in an international lifetime box office gross of just $93.9 million. An editing and compositing master class, each shot of Speed Racer lingers for mere flashes, with overlaid background and foreground action. It’s clear the directors are playing up the manga and animated style — and translating that to film as best as possible…Admittedly, outlandish costumes and absurd colors clash with “so expensive it’s bad CGI” — creating a visual mess at times…which isn’t entirely a bad thing. It’s just its own thing. In general, I agree with Humbert’s assessment of Speed Racer. I think that the Wachowskis did one of the better jobs of translating the style of manga and anime to the screen in a live action format. 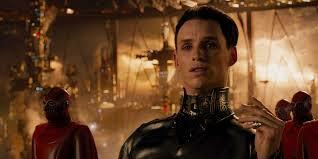 While the CGI isn’t perfect by any means, and some sequences suffer from visual overload, the movie is all uniform enough that even the rougher sequences hold together adequately. Also, when compared to something like Transformers, the visuals actually compare pretty well: in general, it is clear to the audience what is happening at any given moment, unlike in the other franchise. The reason that I decided to take a look back at Speed Racer to begin with was because of a video essay by Patrick H. Willems, a YouTuber who generally makes some insightful and interesting stuff. In his essay, he compares and contrasts the styles and color palettes of Speed Racer with traditional superhero movies like Civil War and The Dark Knight, and talks at length about the modern trend of realism in non-realistic movies. He makes a number of good points: namely, that Speed Racer‘s colors and vibrancy don’t detract from its emotional core. 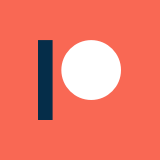 Basically, it doesn’t have to be realistic to be identifiable. Speed Racer is unique and interesting as a result of shirking the accepted norms of realism, which is why it still stands out from the pack of blockbusters visually and stylistically nearly a decade later. Something that definitely stood out more on a re-watch were the smooth and creative transitions that are used throughout the film. A lot of the techniques that are used in Speed Racer are lauded when employed by someone like Edgar Wright. In fact, I think a direct line can be traced between Speed Racer and Scott Pilgrim vs The World. 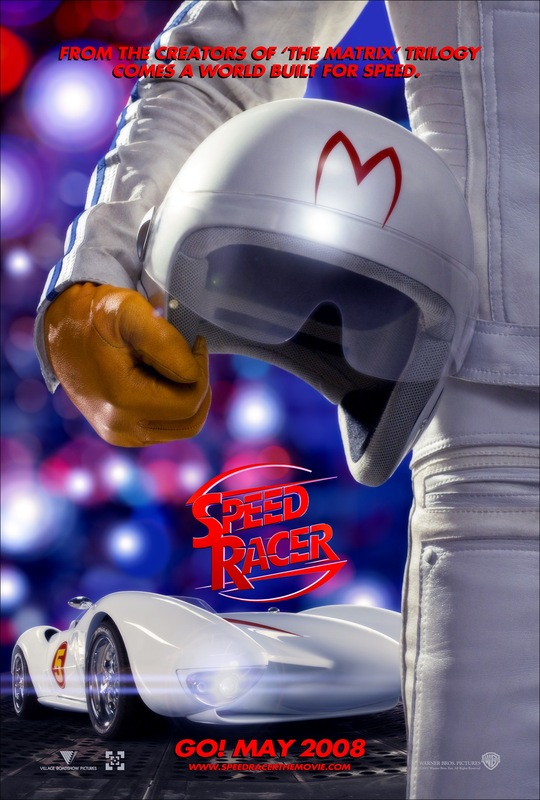 While that doesn’t make up for some of Speed Racer‘s drawbacks, such as its terrible comic relief, shallow characterizations, and less-than-thrilling story, I think the visual craft of the film makes it worth a second look and reassessment on its own. In regards to those stated drawbacks, they are a bit tricky in their own right. It can be argued that the comic relief is accurate to the source material: the same goes for the weak characters and plot. I suppose it is a matter of perspective: if something is bad in the source material, should it be changed for an adaptation, or kept in tact for the sake of accuracy? Personally, I could have done with a whole lot less of the kid and monkey shenanigans, but the plot and characters make sense to me to keep as they are. When it comes down to it, Speed Racer is (and should be) all about the races: to the movie’s credit, that is exactly what the Wachowskis executed. The track set pieces are absolutely electric, and the races are gripping, which is what the movie should have always been about. All of the issues that I hear pointed out about it, outside of the complaints about the occasional moments of visual clutter, are about the fringes of the film. As annoying as the kid and monkey are, they are never front and center. Likewise, the plot is far secondary to the spectacle. Speed Racer is not a great movie. It may not even be a good movie. 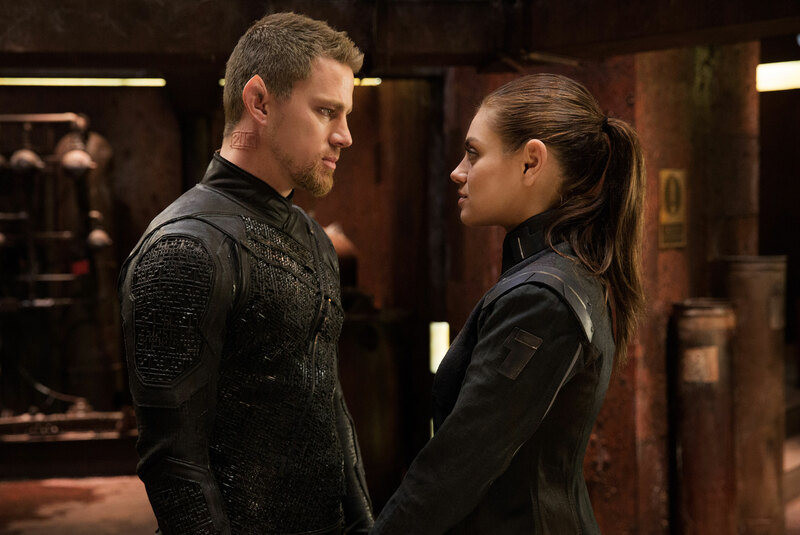 However, it is a creative and interesting movie, that may be the best example we have of what the Wachowskis’ innovative concepts in high gear look like when things generally go right. 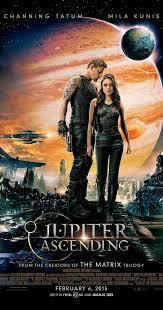 At the very least, I think it is worth another look, particularly in our current era of drab blockbusters. I think that, similar to Batman & Robin, Speed Racer probably came along at the wrong time: it may have been a successfully executed vision, but it isn’t a vision that people wanted.